The 2011-12 NHL regular season is a quarter of the way to the finish line. Exactly where did the time go? Workers are already preparing Citizens Bank Park for the 2012 Bridgestone NHL Winter Classic, and the first week of All-Star Fan Balloting is in the books, with Ottawa chiming in quite loudly. Discussion on playoff and scoring races is getting some traction with most teams having roughly 60 games left to play. Heck, after Sidney Crosby's virtuoso 4-point performance Monday night in Pittsburgh, more than a few pundits were ready to hand the Stanley Cup to the Penguins. You'd like to say slow down, take it easy, but the NHL regular season doesn't allow you to blink without missing something. Teams that are streaking one day find themselves struggling the next. Players that can't seem to skate their way out of a paper bag all of a sudden go on a scoring streak, and vice versa. But, for one day at least, one quiet day in the NHL in which no team or player is changing a trend, we have the time to reflect on what we've already seen this season. 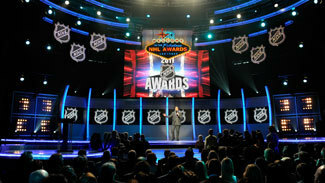 The NHL Awards Show isn't until June, but NHL.com takes a look at the front runners for each award as we end the first quarter of the 2011-12 season. Crosby's Comeback: The stage was set by the Pittsburgh Penguins, who went to the fixin's bar and took a spoonful of everything in order to embrace the return of Sidney Crosby after more than 10 months on the sideline with concussion symptoms. At Mario Lemieux's request, they handed out signs that read "Welcome Back SID" to the fans entering Consol Energy Center. The pregame video was filled with Crosby highlights. The Penguins took the ice for warmups with Aerosmith's "Back in the Saddle" blaring through the arena speakers. When they came on the ice to start the game, a spotlight covered Crosby until Jeff Jimerson sang the National Anthem. Crosby stepped onto the big stage and delivered a performance for the ages, scoring a goal just 5:24 into the game and adding another sandwiched around a couple assists. It was the 21st time he put up 4 points in a game, but it was easily the most memorable. He missed 68 games, including the playoffs, but he's back. Phil the Thrill: He's quiet and unassuming, which isn't an easy combination when you're a hockey star in Toronto. Phil Kessel doesn't always have a lot to say off the ice, but this season he hasn't had to worry about any of that. The noise you hear coming out of the hockey hotbed is the growing contingent of Leafs Nation loudly talking about Kessel's Hart Trophy candidacy. Kessel was the NHL's First Star of the Month in October, when he led the League with 10 goals and 18 points in 11 games. He hasn't slowed down in November as his numbers have ballooned to 16 goals and 30 points in 22 games. With 25 percent of the season complete, Kessel is among NHL.com's candidates for the Hart Trophy. Bruins chase away hangover: They were dreadful in October, and for good reason. How were the Bruins supposed to get up for early-season games after the whirlwind adventure they went on from April through September? Boston coach Claude Julien admitted last week that he and the players thought they were ready for the season, but clearly they were all wrong as the Bruins went 3-7-0. If it weren't for the Columbus Blue Jackets, they would have been the worst team in the NHL on Halloween. But have you seen what is going on in Boston nowadays? The Bruins are riding a 10-game winning streak into U.S. Thanksgiving. They are back in first place in the Northeast Division and have a League-best plus-27 goal differential thanks largely to their 47-17 edge over their opponents in November. Tim Thomas is back among the elite goalies. Leading scorer Tyler Seguin is teaming with Patrice Bergeron and Brad Marchand to form one of the League's most dangerous lines at both ends of the ice. Milan Lucic, Nathan Horton and Zdeno Chara are all back up to snuff as well. Cats purring in Sunrise: The plethora of necessary moves Florida GM Dale Tallon made over the summer appear to be paying huge dividends for the Panthers, who lead the Southeast Division by two points over the Washington Capitals. The Panthers haven't made the playoffs since 2000. Florida's massive overhaul included the additions of Kris Versteeg (team-leading 12 goals and 26 points), Tomas Fleischmann (22 points), Brian Campbell (team-leading 17 assists), Tomas Kopecky (10 points) and Jose Theodore (9-4-2, 2.40 GAA, .921 save percentage). Part of the Panthers dramatic turnaround has been their efficiency on the road (7-4-0), where they've actually fared better than at home (5-2-3). Florida's 32 road points last season were the fewest among Eastern Conference teams. Rookie coach Kevin Dineen has his team in the League's top-10 in goals per game, power-play efficiency and shots on goal per game. Boudreau toughens stance: There have been plenty of signs of what can loosely be called a zero-tolerance policy from Capitals coach Bruce Boudreau, who may not like the accountability storyline playing out in Washington but also can't ignore it. Boudreau benched Alex Ovechkin in the final minutes of a tie game. Earlier this week, he made Alexander Semin a healthy scratch for the first time since his rookie season of 2003-04. He opted to start Michal Neuvirth over Tomas Vokoun in the season-opener, a game, by the way, that did not include second-year center Marcus Johansson. He was a healthy scratch. Mike Knuble, a veteran with a strong voice inside the dressing room, has been dumped onto the fourth line. The Capitals started the season with seven straight wins but have just five wins and 11 points in their last 13 games. They've played 12 games without defenseman Mike Green, who sat out six games with a right ankle sprain only to strain his right groin in his return. He's missed the last four games. Capitals GM George McPhee has publicly backed the moves of his coach, but that hasn't taken away speculation that Boudreau's job is in jeopardy. No matter if it is or isn't, Boudreau is clearly putting his foot down in an attempt to turn things around in D.C. The new teen sensations: Tyler Seguin won't turn 20 until January and Jeff Skinner is 19 until May, but they're no longer the up-and-coming teens in this League. Enter Ryan Nugent-Hopkins, Adam Larsson, Gabriel Landeskog and Sean Couturier -- the NHL's new fearsome 18-year-old foursome. The most outstanding of the quartet Nugent-Hopkins, the top pick in the 2011 NHL Draft, won't turn 19 until playoff time. The way he's been going, he might just help the Oilers get to the postseason. He leads all rookie scorers with 22 points in 21 games, including a 5-point night against the Blackhawks last Saturday. Landeskog's production has been up and down for the Avalanche, but he has 10 points and is averaging more than 17 and a half minutes of ice time per game. Couturier has been a regular in the Flyers lineup after surprisingly making the club out of training camp. He has 8 points in 21 games, though his ice time has gotten slashed lately. Based on the position he plays and the fact that this is his first season in North America, Larsson may be the most impressive of all the rookies, 18 and up, in the NHL this season. The Devils defenseman from Sweden is playing top-pair minutes (22:49 per game) and has 6 points. Welcome to the race: Hello Florida and Toronto. Hello Minnesota and Dallas. Hello St. Louis and Ottawa and Edmonton. Is that you in the playoff chase at the quarter-mark of the 2011-12 season? Oh yes, it is. Welcome everyone. It must feel just grand to be here. The Panthers haven't been to the playoffs since 2000 and the Maple Leafs' drought dates back to 2004. The Oilers' run to the Cup Final in 2006 was their last postseason appearance. The Wild and Stars last made it in 2008 while the Blues last did in 2009 and the Senators in 2010. All seven teams are very much in the hunt right now. Five of them have new coaches this season with Dineen in Florida, Mike Yeo in Minnesota, Glen Gulutzan in Dallas, Ken Hitchcock in St. Louis and Paul MacLean in Ottawa. Of the five, only Hitchcock had previous NHL head coaching experience. Wild times in Minnesota: As we just mentioned, the Wild are on the rise and in the hunt under Yeo. But, they deserve their own separate breakout in this space because their storyline has been well worth following. The Wild have jumped to near the top of the Presidents' Trophy race (yes, we know it's too early) with a remarkable run through November. They are 9-2 in November after going 4-3-3 in October. They're doing it with goaltending and defense. Josh Harding is pushing Niklas Backstrom and both have been sensational, allowing the Wild to have the League's best defense so far this season (1.95 goals-against per game). They've held the opponent to two goals or less in 14 of their 21 games. They're only averaging 2.24 goals per game, but the Wild are getting just enough offense from Mikko Koivu, Dany Heatley, Matt Cullen, Pierre-Marc Bouchard and Devin Setoguchi to win these close, low-scoring games. Tough times in C-bus: The Blue Jackets made a splash over the summer by trading for Jeff Carter and signing James Wisniewski to a five-year, $33 million contract. Carter was supposed to be the long-lost No. 1 center for captain Rick Nash and Wisniewski was supposed to be the power-play quarterback the Blue Jackets have never had. The moves pushed Columbus into spending-to-the-cap range, but it hasn't quite worked out as planned, and now the team with the almost $63 million payroll is in a hole it may not be able to dig out of despite the fact that lately it has been showing some signs of life. The Blue Jackets went 0-7-1 to start the season and fell to 2-11-1 in a 9-2 loss at Philadelphia on Nov. 5. Scott Arniel spent the next four days overhauling their systems and the Jackets have been better of late behind the surprising play of goalie Curtis Sanford, whose start last week in Boston was his first since Jan. 10, 2009. However, Carter, who missed 10 games with a broken foot, has been unimpressive. Wisniewski missed the first eight games due to suspension, but he hasn't had a major impact since joining the lineup. Nash has 15 points, but his defense has lagged. Steve Mason's goals-against average is abysmal.